Having real world objects that are tracked in VR is truly a game changer! I never thought I could achieve presence in a mini golf game but low and behold just the simple act of strapping one of my Touch controllers to an old putter was enough to do it. 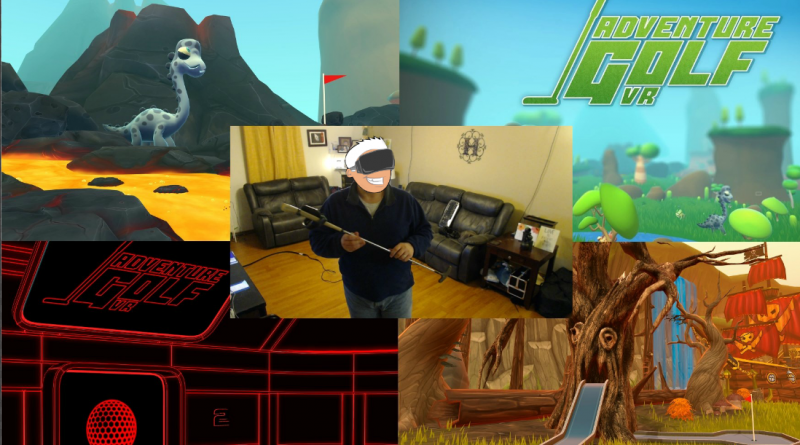 I had played Adventure Golf VR with just my Touch controllers the night before making this video and all though it was fun, I couldn’t seem to make a very accurate putt. Without feeling the weight of the club the act of keeping my shots straight was a bit difficult. The next morning I remembered that I had an old putter out in the garage and I decided to see if just strapping it to the club was enough to give me that sensation and it worked out brilliantly! Overall Adventure Golf VR is already a fun 3 course mini golf game but adding a tracked putter just took it to another level. The fact that the game allows for dynamic resizing of the putter helped me to get the real putter I was using to line up pretty much 1:1 with the virtual one in the game. Playing Adventure Golf VR in this way has now made me curious to see how well this would work in some of the other VR golf games. After this experience all I can say is if you happen to have an old putter laying around grab your Touch controller and strap it to the club and you too can be playing real mini golf in your play space! ← Reficul Is A New Open World VR Survival Horror Game Launching Into Early Access Today And It Is Terrifying!